Monster version of the SH000A1 for terry cloth, bulky fleece, quilt sandwiches, heavy fabrics, continuous embroidery and allover embroidery. Hoop and align fabrics with just one easy step Just lay fabric over the metal bottom frame and snap the magnetic top frame in place. Minute adjustments can be made by tugging on the fabric without distorting fibers or puckering The standard 5" x 7" 130mm x 180mm sewing field has no borders, so it can be expanded to create continuous embroidery Handles knits, wovens, even quilt sandwiches and allover embroidery, with flawless results. 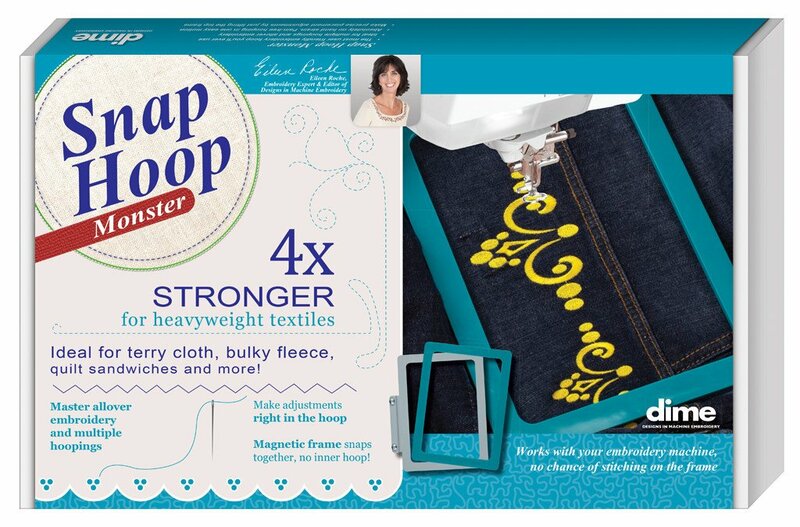 Embroidery machines recognize MagnaHoop, so there is no chance of stitching on the frame.